The Celtics capped off their five-game road trip with yet another loss, this time in the hands of the 9-3 Portland Trail Blazers. For the third straight game, the Celtics found themselves fighting to climb out of a big deficit. This time, the comeback effort fell short as Boston dropped four of their five games on the trip. The Celtics opened the game with a whole new gameplan on the offensive end. Rather than settling for three after three like they have been much of the season, Brad Steven's unit was getting different types of looks - drives to the hoop, mid-rangers, and so on. Just two of their first 16 shots were from downtown. However, this strategy did not pay any early dividends for the Celts. The shots weren't falling all too much, and a few minor mistakes were enough for the Blazers to start pulling ahead, led by their big man Jusuf Nurkic. In seven minutes, Nurkic had his way in the post, pouring in 12 points without missing a shot. Portland's double-digit lead built by the starters instantly shrunk to five once their second unit replaced them. This was largely due to Jayson Tatum's two jumpers at the end of the quarter, which accounted for Boston's last five points of the frame. With the Celtics finally finding some footing, they trailed by just five at the end of the quarter despite an early double-digit deficit. Both teams spent the opening minutes of the second quarter exchanging blows. The first four Celtics buckets came from four different players, as everyone was getting their looks. However, between a mix of poor shooting, isolation plays, and playing a defense that forced mid-range looks, the Celtics offense was nowhere to be found. 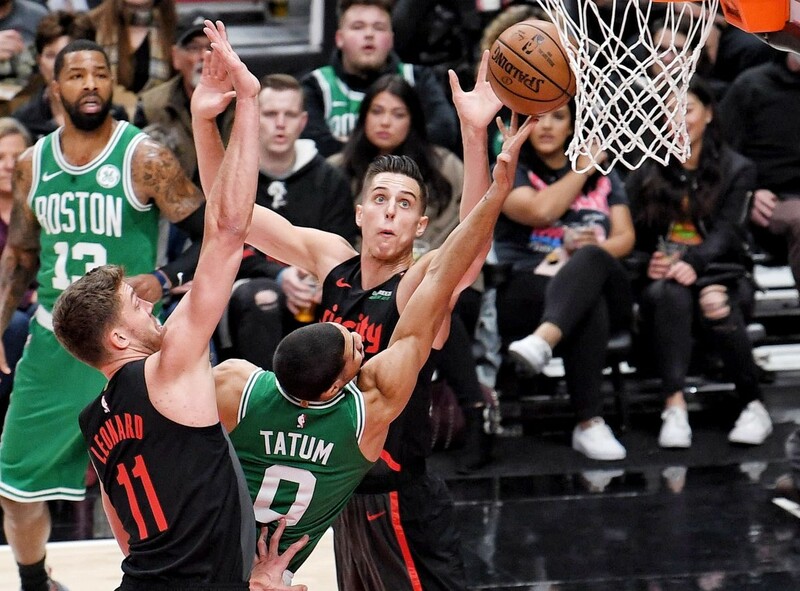 Tatum's efforts were not nearly enough to compete with the Blazer's impressive offense. They continued to find the open man against the Celtic defense - even Meyers Leonard came off the bench to knock down a pair of threes and score eight points in the half. Portland managed to build a lead using the scoring of their role players, as Damian Lillard and CJ McCollum combined for just eight points. That being said, Lillard was certainly playing a role in their effective offense, as he dished out eight assists - Lillard alone had more assists than the Celtics team in the first half. This game followed the same theme from the rest of the road trip of the Celtics digging themselves into massive holes: This marked the third consecutive game that the Celtics faced a 19-point deficit. Four straight Tatum points slightly helped aid this, but ultimately found Boston down big entering the intermission. The Celtics turned a switch in the second half. They turned up the defense which, in turn, turned up the offense as well. Fast break points and open shots saw Boston trimming 10 points off their 19 point deficit in the matter of one minute and sixteen seconds, resulting in an early 3Q timeout for Terry Stotts. After shooting 2-11 from three in the first half, the Celtics shot 7-15 on their following attempts in the third. This shooting brought them back to within six, but another seven-point run by the Blazers put them right back up by double-digits entering the fourth. The Blazers refused to give in, however. Lillard and Irving dueled off, each hitting some key shots for their ball clubs. Boston was right there; they had their chances down the stretch. Down the stretch, it wasn't Lillard or McCollum that killed the Celtics. Al-Farouq Aminu, the career 33% three-point shooter, drilled two deep treys, including the ultimate Boston dagger, to stop the Celtics comeback in its tracks. The Celtics were still just down by six, but their next two shots were well contested, tough three-point shots by Kyrie and Tatum that didn't fall. Despite Tatum's strong performance (27pts, 8rebs) and Kyrie's strong second half that saw him finish with 21pts, 6asts, and 5stls, it was another dissapointing loss for the Celtics. Nurkic had 18pts and 17rebs for Portland, while Lillard was productive with 19pts, 12asts, and 5rebs.